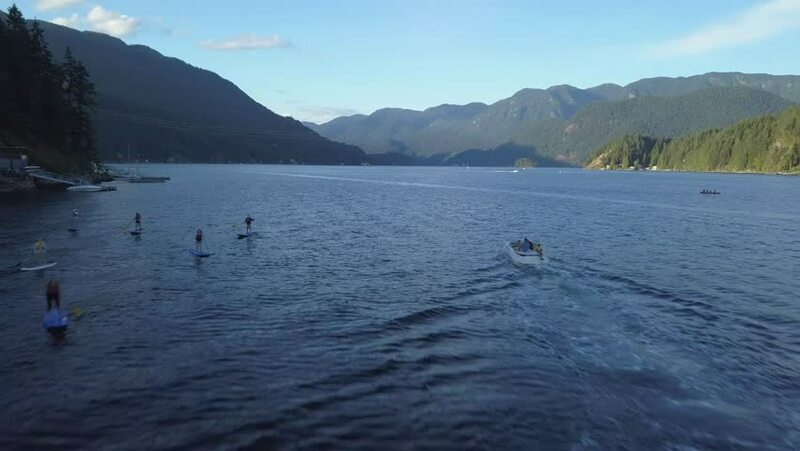 People on stand up paddle boards in Indian Arm Deep Cove Vancouver. Drone view over water and surfers. Boats cruising by, woods, hills in background landscape. 4k00:12Newlyweds on a boat. Wedding in Montenegro on a yacht. The bride and groom on a splendid yacht floating on the Kotor Bay in Montenegro. hd00:13Misty mountain sunrise over a lake. 4k00:414k Aerial flying to Samaesan beach. 4k00:14Aerial drone view of boats anchored in the bay with clear and turquoise water on the sunset. Boat and yacht in the tropical lagoon. Tropical landscape. El Nido, Palawan island, Philippines.